I love Minecraft and love telling fart jokes (who doesn't?). So thought this would be the perfect combination of both. 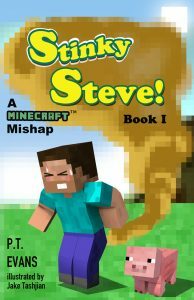 I live in the world of "what if", so being a Minecraft player, i thought, what would happen if my character couldn't stop farting. Then I laughed and started writing it all down on paper. Since my characters existed in the game Minecraft already, I had to envision what they would be like in a real life situation. How would I interact and communicate with them? What situations would be funny, which ones would be horrifying? What adventures could I have? It’s another great day in Minecraft. Clouds float across the perfectly blue sky as I go outside to check on my animals. There was a small incident with the Creepers last week so I’m happy to see that today the chickens are safe and sound. But what’s going on with my pigs? Do they know something I don’t? Their diet hasn’t changed; are they sick? Afraid? My body starts shaking – did someone install a new earthquake mod? That would certainly explain the animals’ behavior. My body jerks forward; a loud explosion slams me into the fence. Like a wave of energy hitting me from behind. Is someone detonating TNT? The pigs stare at me blankly, wrinkle their noses, then run to the other end of the pen. I’ve lived in Minecraft for years, but I’ve never smelled anything like the stink that fills the air today – worse than a pile of zombies rotting in the sun. I turn around to see what could possibly be fouling up this Minecraft universe. There’s a dark cloud hovering above the dirt, moving forward. Wait – it’s following my every move. Oh no! Is that brown cloud coming out of ME?